A new study finds that relatively little methane reaches the surface above known subsurface methane seeps in he ocean near Svalbard. Instead, the methane helps trigger phytoplankton blooms in the ocean that pump down atmospheric CO2. This is a newly discovered NEGATIVE feedback effect, i.e. as global warming destabilizes methane hydrates in deep water sediments, the methane seeps result in CO2 being removed from the atmosphere above the seeps, slowing global warming. Just shows how complicated the planet is.....new physical processes are being discovered all the time! The paper is about how best to reconstruct the evolution of the coastline during the inundation of the ESAS since the Last Glacial Maximum. It does not support any of the points he was trying to make, and pretty much says that ocean basin deformation elsewhere in the Arctic, should be taken into account as well as glacial melting when modeling coastline evolution since the LGM. No doubt posted as an obfuscation of the fact that he did not know that northeastern Eurasia was not glaciated during the LGM as reflected in his snarky comment. Semiletov made a ludicrous claim that basically billions of tons of CH4 would be catastrophically released from the ESAS (basically over ten times the whole current global emissions packed into a tiny fraction of the Earth's surface). It is self-evident that we have to seen any such catastrophic outgassing. Also, it is self-evident that we are not at the beginning of such an event. This begs the question as to how much dissociated CH4 there is in the ESAS and I have yet to see a proper survey to quantify this amount. Claiming all clathrates in the ESAS are dissociated and held back by collapsing permafrost cap is dubious. This cap has been leaking for the last 18,000 years. Gas is very efficient at leaking so it is consistent with what we see today: period bubble plumes but not eruptions of Biblical proportions. Almost by definition most of the CH4 locked in the ESAS is in clathrate form. Seabed permafrost is not sedimentary cap stone under large pressure. The 50 meters of water depth combined with leaky permafrost in the seabed is not enough to cap vast amounts of gaseous CH4. Adding to the missing CH4 debate: the ESAS depth is too shallow (50 meters) to have CH4 chemically processed by bacteria before reaching the surface. Also, the catastrophic nature of the predicted release would result in enormous bubbles of pure CH4 heading for the surface. So all of the alleged permafrost capped CH4 would reach the atmosphere. The issues for the ESAS is the amount of gaseous CH4 trapped in the seabed ready to escape. People making wild claims about cataclysmic releases need to provide some evidence instead of "pro-rating" some plumes. This sort of "pro-rating" is BS since every plume would then be sourced from locked up gaseous CH4 and not decomposing clathrates. That is clearly not the case for the Arctic Basin. Cid_Yama wrote: You got it, Plant. Plant, that is the Ruppel paper that has been debunked, that I referred to in the above post. They only mentioned half of the cycle. An intentional deception that was quickly ridiculed. Dissident, you are so full of it. No one claimed all hydrates on the shelf were dissociated, and now you are just emoting, and talking nonsense. Why don't you try presenting an actual argument, present documention to support you position. That sort of thing. Ranting doesn't get you far around here. Might I suggest you read this interview, so you know the current claims, so you know what you are arguing against. There is a wonderful attached video. In this study, we discussed the influence of GIA on the transgressional evolution of the Laptev and the East Siberian seas. Former reconstructions of the transgressional evolution of the these seas were based on the eustatic sea-level change to reconstruct the evolution of the relative sea-level history, whereas it was assumed that this region is located far enough from Scandinavia and North America to be influenced by the ice loading processes of the respective glacial ice sheets. Solving for geodynamically consistent GIA with a spherical symmetric earth structure, where the sea-level redistribution due to mass conservation and change of the geoid is considered, we tested this assumption and reconstructed the sea-level evolution and transgressional history of the East Siberian Shelf region. To allow for uncertainties in the earth structure, we considered a range of earth models by systematically changing the lithosphere thickness as the upper and lower mantle viscosities. what they say is that East Siberian seas are more influenced by hydro eustacy as compared to their western counterparts where GIA is dominate but not entirely. Isostacy plays a role definitely in the Laptev sea which is adjacent to the ice front and a small role as you move to the east into Eastern Siberia offshore. 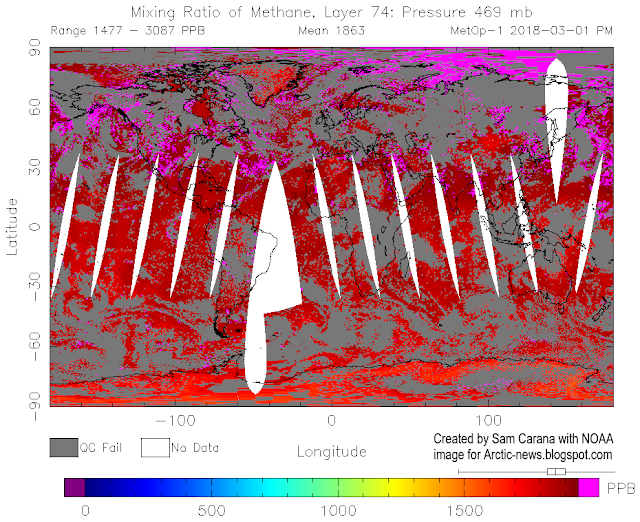 And the claims of methane release extend into the Laptev sea so GIA is obviously a concern. Once again who is try to obfuscate here? debunked by who? I checked and could not find a Discussion that had been submitted to the journal in regards to that paper. Ruppel is a co-author, the lead author is J.W. Pohlman. ...we tested this assumption and reconstructed the sea-level evolution and transgressional history of the East Siberian Shelf region. did you not even read the conclusions? Deformations due to the eustatic sea-level rise appear as hydro-isostasy around the continental margins [10, 20, 31]. The mechanism of hydro-isostasy can be described as the flexure of the lithosphere in response to the changing water load: The global sea-level drop of 120 m during the last glacial maximum (LGM)  had unloaded the ocean bottom which resulted in an isostatic uplift of the ocean basins by 40 m when measured against the continents which do not suffer from such a load change (we assumed here the density ratio between water and mantle material to be one-third). During the termination of the glacial ice sheets, the sea level rose again, resulting in a loading of the ocean basins. At the continental margin, the elastic flexure of the lithosphere controls the bending of the lithosphere due to this loading contrast. This flexure is, similar to post- glacial rebound, an ongoing process due to the retarded response of the viscoelastic mantle material with subsi- dence offshore and uplift onshore. If there was no link between GIA and eustacy there would be a absence of hand-wringing over melt rates in Greenland and Antarctica. Personally if I am looking at a temperature map I find the absolute values much more useful than the anomaly values. If the temperature is typically -70 C and it has warmed to -40 C that is interesting and all, but just a fact. If on the other hand the temperature has gone from -20 C to +10 C that is a critical change. The increasing ice free and ice slush period is the real story. It means that the Arctic Ocean is now accumulating a lot more heat energy. At the same time the lack of thick ice sheet allows atmospheric winds to impose more mechanical forcing of the ocean surface layer. This increases the exchange of water with lower latitudes via more robust currents. So this is yet another source of warming. The warming Arctic Ocean will exert a progressively larger influence on the polar climate. 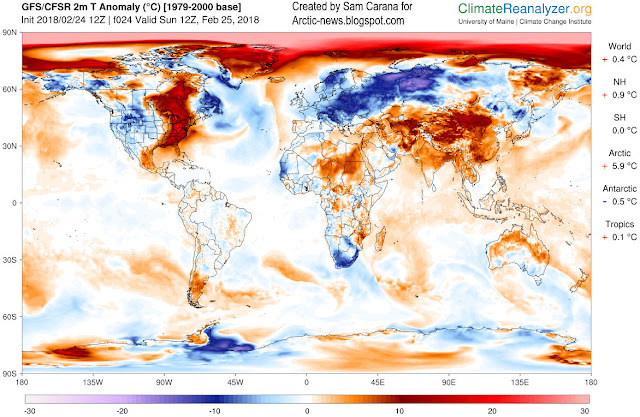 Even if the surface temperature in winter is low, there is an accumulating thermal plume working its way into both the seabed and the permafrost regions. This will force CH4 release from cryospheric reservoirs. Tanada wrote: Personally if I am looking at a temperature map I find the absolute values much more useful than the anomaly values. If the temperature is typically -70 C and it has warmed to -40 C that is interesting and all, but just a fact. If on the other hand the temperature has gone from -20 C to +10 C that is a critical change. Calculate the huge amounts of energy injection to get 30 C°+ warming over the arctic ocean. Now the reader can see the dramtic effect. There is only one thing we human mankind can do : SURRENDER and give up war against our Habitat. Get off burning fossil fuels! And to the leaders of the fossile fuel industry i advise you to make sepukku! Soon (this century) the whole planet will burn to desert. Apparently, somehow those craters from exploding pingos can erupt again! I think the use of the term explosion paints the wrong picture in peoples minds. From all the pictures there was no flame or burning gas involved. It is more like the bursting of a giant bubble only the skin of the bubble is ice and frozen earth instead of soapy water. To move that much material there had to be a large amount of gas under a lot of pressure but it could have been compressed nitrogen instead of flammable methane and achieved the same result. With about twelve of these spread across the vastness of Siberia in the last couple of years perhaps this has been going on right along only there was no one on the ground to witness it. "burst or shatter violently and noisily as a result of rapid combustion, decomposition, excessive internal pressure, or other process, typically scattering fragments widely." I'm not sure what mechanism would concentrate that much pressurized nitrogen to build up in that area, so methane certainly seems like the most likely culprit. I was not proposing that it might have been some other gas then methane, just that a gas is a gas and one can be put under the same pressures as another ( not talking liquefaction pressures here just what is needed to lift and move the ice). Yes you are correct on the definition of an explosion but people today have watched so many movies where the heroes run and jump fast enough to avoid being killed by an "explosion" and not one of them happened without a very movie land satisfying fire ball. On Wednesday I was asked to look into the possibility that there had been an eruption on the West Coast of Sweden. It was one of those phone calls that are really confusing and making you wonder if it is you, or the rest of the Universe, that has gone utterly bonkers. Since it was an official request I had to go and take a look at things. But, let us begin from the beginning. On Monday 16/4 2018 a lot of coastal residents in the islands around Gothenburg started to call the Swedish Coast Guard about a suspected oil spill. A distance of 150 kilometres was inundated by grey globs and water with light grey suspended goop. The Coast Guard quickly came to the conclusion that it was not an oil spill, and sent samples for laboratory testing since they suspected that it was some sort of algae bloom of unknown origin. Simple microscope studies gave at hand that there was no algae to be found in the samples. In fact, there was no organic structures at all in it. And this is consistent with deeper sediment layers. Yes, they started out as organic sediments (mostly), but over time all organic structures will be removed and only the organic base products will remain. It was about that moment I was called in to take a look at it, and I must admit that I was rather amused as I went. The idea of a volcanic eruption in the waters outside of the Swedish West Coast is pretty hilarious, if you know your geology. As I came to the coast and started to look at the goopy lumps and the greyish water I had a feeling that I had seen this before in other parts of the world. The lumps were like modelling clay, and the suspended grey material had a distinctly muddy look to it. The surprising part was that the lumps floated in water. In the call they had said that it was like ash covered in fat. But, as I looked closer it was just very finely ground clay, and that can feel quite fatty as you handle it. And as I stood there I understood what it probably is, and that I had indeed seen it around the world. Even though the hyperbolic press found it all to be unknown, unheard of, and a new thing, it turned out that this has happened before along the same stretch of the coast. Last time it happened was on the 27th of November 2017, but earlier finds are also known. This also strengthened my belief that we are dealing with a mudcano out in the waters. There are also known deposits of hydrocarbons out there, but they have been deemed to be commercially unviable. Any methane deposit would reside at a fairly shallow depth with a maximum of 4 kilometres. And the magma under Norway is residing at a depth of more than 44 kilometres. It is though possible, even if it is farfetched, that there has been a dyke formation quite some time ago, and that this has warmed the deposit of methane. Yes, methane causes mud volcanoes around the world. Anywhere the pressure finds a path to escape. He appears to be unfamiliar with the current research regarding subsea methane release in the Arctic, though that is what he is describing. Magmatic warming is not necessary. Though geothermal flux warms sediments from below without it being a magmatic event. Researchers tend to frame phenomena within their own discipline. "The major differences between the Permian event and ours is time and fuel used. The Permian event took over 60,000 years to unfold. Ours will only take 300 (we're close to that now). The other is that we have used more fuel than the Permian event. During the Permian, only carbon based life at the surface burned and whatever fossil fuels that were near the surface. None of the buried deposits were burned off. We are burning those now. The most ancient deposits are from an older mass extinction and that was found in Australia. We are currently drilling that one to the surface now. Oil is essentially the brewed remains of past extinction events. The Permian event only had it's own fuel from the surface life at the time. We are not only burning the surface life but we are also burning the unused fuel of all 5 past extinction events. That is why the Earth will go into Venus mode. We have super charged a Permian styled events 5 times more than would naturally be possible. Oil should have been left in the ground."